A large fire has damaged one of the most significant holy sites in the Tibetan capital Lhasa. The Jokhang temple caught ablaze on Saturday 17 February, with video footage showing parts of the building caught in flames quickly spreading on social media. The Communist party controlled news agency, Xinhua, reported that the blaze was quickly extinguished. Yet, Robert Barnett, an expert on Tibet, stated that Beijing’s reporting on the fire was quite worrying, for it showed a “total suppression of information”. This has caused many Tibetans themselves to fear that a much larger amount of damage has been caused, which is not being reported by the state controlled media. Barnett commented further that the limited information coming from the region meant it was difficult to assess the extent of the damage. A large fire has damaged one of the holiest and most politically sensitive sites in Tibet, the Jokhang temple, stirring an outpouring of grief and concern among Tibetans. Dramatic video footage posted on social media showed flames devouring part of the seventh-century Unesco world heritage site in Tibet’s spectacular high-altitude capital, Lhasa, on Saturday. China’s Communist party-controlled news agency, Xinhua, said the blaze started early on Saturday evening “and was soon put out”. However, Robert Barnett, a London-based expert on contemporary Tibet, said Beijing’s “almost total suppression of information” about the incident meant many Tibetans feared “the heart of Tibetan Buddhism” had suffered significant damage. For almost four hours after the fire began, he said, it was not even acknowledged by China’s heavily controlled media, “even though you could see it from miles away across the whole city”. Barnett said the limited information emerging from the region – from which foreign journalists are barred – meant it was difficult to assess the extent of the damage. But as images of the conflagration spread on Saturday the academic recalled receiving calls from distraught Tibetans mourning the apparent destruction of one of their most sacred sites. 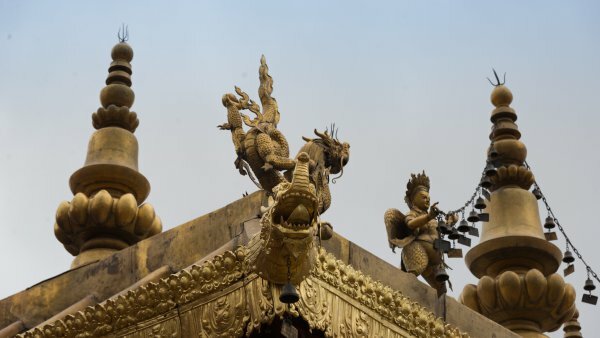 China’s efforts to control the narrative surrounding the fire underscores the Jokhang temple’s huge political as well as religious significance. In recent decades the 2.5-hectare (6.2-acre) complex has been the site of repeated protests against Chinese rule, including one “astonishing act of defiance” witnessed by foreign journalists during a rare 2008 propaganda tour.